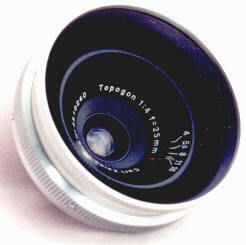 The Topogon is an East German Zeiss Jena lens introduced in 1950 for the Contax Rangefinder. It is one of the most difficult to find Zeiss lenses, and the first 35mm format lens to be made commercially in 24 or 25 mm focal length. I am not sure of the production, but based upon the rarity, I doubt if it was more than 200 or 300 lenses. 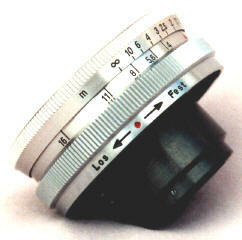 This is a coated red T lens, four elements in four groups, f/stops 4 to 16. 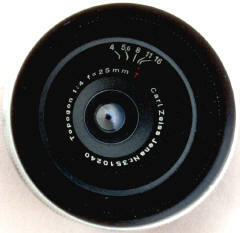 Note the deep set aperture ring set from inside the lens -- just like the later 25/4 Nikkor rangefinder lens. hmm. Pics are larger than life size for illustration purposes. Pictures supplied by an anonymous collector.